WWE Survivor Series 2014 is out on DVD and Blu-Ray now, available from www.wwedvd.co.uk. Broadcast live on Pay-per-View (and the WWE Network) from the Scottrade Centre in St. Louis, Missouri, USA on 23rd November 2014, the show features John Cena, Ryback, Erick Rowan, Big Show & Dolph Ziggler battling Seth Rollins, Rusev, Luke Harper, Mark Henry and Kane in a traditional Survivor Series elimination match, Bray Wyatt taking on Dean Ambrose, Goldust & Stardust defending the Tag Team Championship against Los Matadores, The Miz & Damien Mizdow and The Usos and three other matches. The special features include one other match, the return of Bad News Barrett and two interviews. The show begins with a vignette detailing that this is a one match show, the main event featuring Team Cena vs. Team Authority is all that get's a look in. Things continue as Jerry Lawler, Michael Cole and John Bradshaw Layfield welcome us to the show, reminding us of the importance of the main event. A completely superfluous in-ring segment featuring Mr. McMahon telling Triple H and Stephanie McMahon that if their team loses tonight, John Cena is the only man who can bring them back follows, and the shows theme of filler is introduced early on. The first bout see's Los Matadores, Miz & Mizdow and The Usos challenging Gold & Stardust for the Tag Team Championship in an average, slightly sloppy bout. The finish raises the quality of the bout, with an exciting series of moves that get's everyone in the match involved well. Backstage, Adam Rose and The Bunny challenge Slater Gator to a match later on, because reasons. A four on four Survivor Series Elimination match pitting Alicia Fox, Emma, Naomi and Natalya (accompanied by Tyson Kidd) against Layla, Summer Rae, Cameron and Paige features some questionable booking and clumsy wrestling, although at least it does attempt to tell some sort of story. Highlights from the Kick-Off show are shown next, including Fandango taking on Justin Gabriel and the return of Bad News Barrett. The Kick-Off panel also get involved, as Renee Young asks Booker T, Alex Riley and Paul Heyman about the upcoming main event, because there's no other matches on the show. 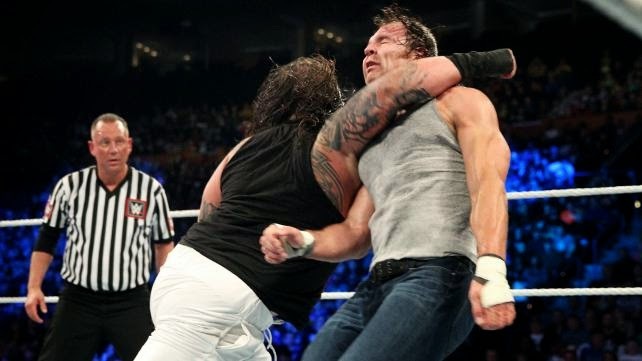 Dean Ambrose and Bray Wyatt put together a good solid bout, but there's clearly more than an eye on next month's TLC pay-per-view. It's let down slightly by teasing a big spot and not delivering it, but still an entertaining watch. Backstage, Triple H gives Team Authority an impressive pep-talk, whilst Stephanie continues to steal the show with her performance. Adam Rose and The Bunny takes on Slater Gator in a match that happened. Roman Reigns returns to our screens in an awkward interview with the commentary team. John Cena decides his team also needs a pep talk, although he can't quite deliver the intensity of Triple H's promo and most of his team don't seem that arsed anyway. AJ Lee defends the Diva's Championship against Nikki Bella (accompanied by Brie Bella) in a super short match, as Sheamus and Daniel Bryan's WrestleMania 28 match is referenced for the umpteenth time. 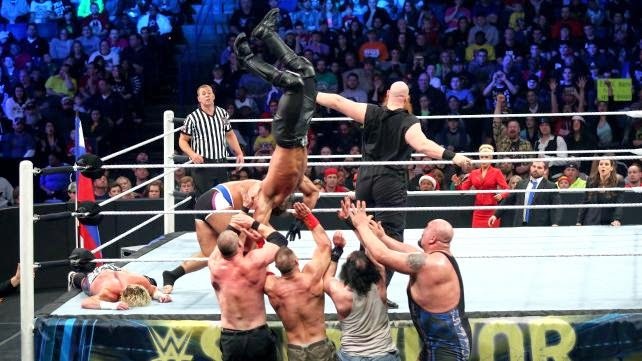 The main event of Team Authority's Seth Rollins, Rusev, Luke Harper, Mark Henry and Kane (accompanied by J&J Security, Lana, Stephanie McMahon and Triple H) taking on Team Cena's John Cena, Ryback, Erick Rowan, Big Show and Dolph Ziggler in a story-driven, character-based epic. Ziggler is the stand out of the bout, looking like a star throughout, with fantastic selling and some great sequences opposite Rollins and Harper. Throw into the mix the surprise WWE debut of a wrestling legend (spoiled on the box art) and you've got a masterclass in sports entertainment. One of the strongers matches from the latter half of 2014, this match makes the rest of the show just about bearable. Fandango (accompanied by Rosa Mendes) takes on Justin Gabriel on the Kick Off show match, that is essentially a squash that's good while it lasts. Bad News Barrett's return is used to push the main event even further, and brings plenty of Bad News in an entertaining promo. Byron Saxton interviews Dean Ambrose, with Ambrose continuing to nail his character, whilst furthering his feud with Bray Wyatt nicely. Saxton also speaks to Nikki and Brie Bella, in which nothing is actually revealed about Nikki's match earlier in the night, a rather pointless inclusion. There's no doubt that WWE saw this as a one match show, with almost all the focus landing on the main event. Whilst that main event does deliver in spades, the rest of the show lacks any real attention and the performances are mostly flat. Dean Ambrose and Bray Wyatt give it their best shot, but the finish would have been more fitting if there was anything else going on elsewhere on the show. Certainly not a classic Survivor Series, but the fact that the Best PPV Matches of 2014 DVD release stopped at October, means this is currently your only way of physically getting your hands on a slice of sports entertainment gold.